Karsh photograph signed as Pope. Pope from 1978 to 2005. He is widely known to Catholics as Saint John Paul the Great. 7.75 x 9.75 inch photo on the original 11.0 x 14.75 inch photographers mount. Signed and inscribed by the Pope on the mount below his image Al carissimo Mons. Justo Mullor Garcia nunzia apostolico in Abidjan Joannes Paulus PP. Photograph by Yousuf Karsh and printed on verso No. 7 filled in by hand (pencil). Photograph shows also a printed signature of Karsh below the image of the Pope. Minor foxing and minimal scratches on the photograph, else good condition. Signed photos of John Paul II. As Pope are rare and this one is surely one of the finest known to exist. He has been described as one of the greatest portrait photographers of the 20th century. Mullor Garcia was ordained to the priesthood in 1954. From 1979 to 2000 he served as apostolic nuncio, then he served as President of the Pontifical Ecclesiastical Academy from 2000 to 2007. COMES WITH A CERTIFICATE OF AUTHENTICITY BY ANDREAS WIEMER HISTORICAL AUTOGRAPHS. Please do not hesitate to contact me with any questions. I started collecting autographs of famous personalities as a teenager in 1985. My large reference library includes all the standard works with more than 100 books on the subject. Im a member of all major autograph organizations and the author of several published articles and reference books incl. The standard works: John F. Kennedy autograph study and Presidents of the United States AUTOPEN GUIDE. My slogan has always been: "Think inversely". 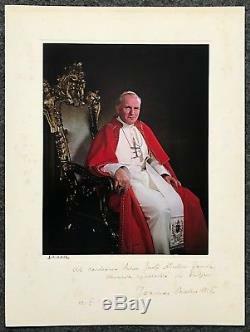 The item "John Paul II, Pope One of a kind Y. Karsh photograph signed as Pope" is in sale since Wednesday, March 7, 2018. This item is in the category "Collectibles\Autographs\Historical". The seller is "autographs26771" and is located in Kelkheim.